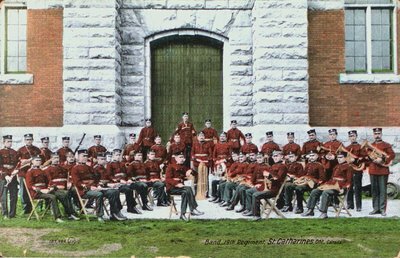 A postcard of the band of the 19th Regiment outside the Armouries on Lake Street, St. Catharines Ontario. c1910. Published by Valentine and Sons Publishing Co., Ltd. Printed in Great Britain. The 19th St. Catharines Regiment, after two redesignations, amalgamated with the Lincoln & Welland Regiments.